Had To Be Ivory, under jockey Tony Phillips, rolls to his fifth-consecutive win in Monday's $95,548(US) Alex Picov Memorial Futurity at Ajax Downs. Had To Be Ivory Stays Perfect at 5-for-5 In Alex Picov Memorial Futurity AJAX, ONT�OCTOBER 9, 2017�Under jockey Tony Phillips Had To Be Ivory easily defeated Aj Chick In 15 Monday afternoon in the $95,548(US) Alex Picov Memorial Futurity, keeping to keep his record a perfect 5-for-5. Had To Be Ivory cruised over the Ajax Downs 400-yard course, rated "heavy" with a 7-mph headwind, in a quick :19.940 seconds to earn a 101-speed index and win by three-quarters. Trainer Bryn Robertson saddled the son of multiple stakes sire IVORY JAMES to his second stakes win for owners' Carol and Jaime Robertson. 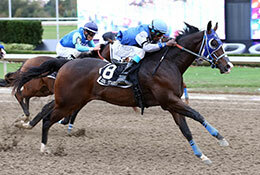 The Ontario homebred won the John Deere Ajax Juvenile Challenge in July. He picked up $40,805(US) today to bring his bankroll to nearly $70,000. The multiple stakes winner is out of stakes winner Had To Be Fandango. The daughter of Hadtobenuts won the Maple Leaf Derby at Ajax Downs in 2011. The royally-bred Aj Chick In 15, who was claimed for $10,000 in May, picked up $18,009(US) for owner Milena Kwiecien. Jason Pascoe trains the bay filly out of the champion mare PJ Chick In Black. Kwiecien claimed Aj Chick In 15 at Remington Park, then broke her maiden in next start at Ajax Downs July 9. Ramiro Castillo rode the bay filly who has banked $27,328 this year. D. Bowen, S. Taylor and J. Smith Farms bred Aj Chick In 15 in Oklahoma. Kwiecien and Pascoe also teamed with stablemate Island Vodka to finish a neck back in third-place. Scott Sterr rode the Texas-bred. Bred by Alan Sharon Colley, the stakes-placed filly earned $9,004(US) for her effort. Diane Dynamite, Senator Woot, Silky Senator, Express Your Desire, Miss Racy Eagle and Firing Red Jess completed the field. Draggin Wagon was scratched.